Sometimes, you will run into advice on the Internet that is just blatantly wrong. That’s inevitable, it’s the Internet and you can’t believe everything you read. But, that’s why we’re here… To correct those common B2B misconceptions you have probably ran into over the past couple of years. If your B2B is not as successful as you know it truly could be, it’s probably because you are following one of these B2B myths! 1. Your B2B doesn’t need a blog. Lies! This is a big, fat lie. Your B2B will be unsuccessful if you do not optimize your SEO. Blogging is one of the best ways to augment your SEO, aside from paying a buttload of money to get your site number one on Google search. Blogging, as we have said time and time again helps you to establish yourself as a leader in your industry, it provides the Internet with branded content they can share with their friends, family, and acquaintances. Your blogging content can be shared with your customers as a helpful aid for FAQs, you embed your RSS feed into your website, so you can build trust with potential buyers, or your sales team can use your blog as leverage during calls. As you can see there are countless ways that B2Bs benefit from blogging, so no more listening to those people who claim it is unnecessary! 2. Social media marketing is unnecessary for B2B. So, you think your business doesn’t need social media, eh? Wrong! Social media helps you to brand your business. Plain and simple. Social media allows you to create a universal branding message, interact with your customers and potential customers on a daily basis, and make your business more attainable… Everyone wants to buy from their best friend, not some stranger… And social media allows you to become your customer’s best friend. Plus, the more involved you become on social media, the more you will learn about your industry. You will stay on top of the most recent news, learn how your competitors are branding their businesses, and monitor what works and what doesn’t work. 3. 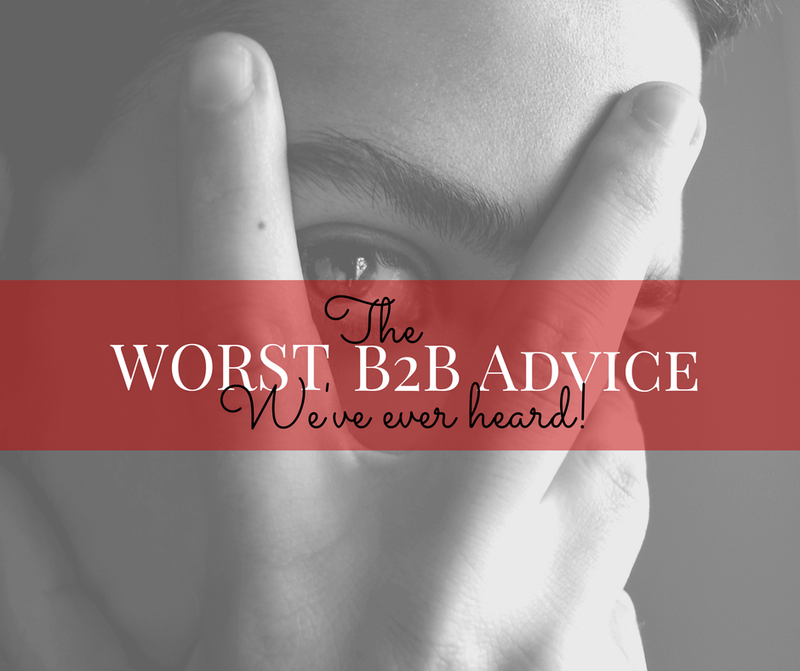 Your B2B tone of voice in all marketing endeavors should be stuffy and ‘business-like’. There is nothing worse than reading a blog that has a really stiff, uptight tone. Who wants to read a blog that sounds like it was written by the most boring person in the world? Uhm, I sure don’t. For every successful brand, every successful blogger or video blogger, there is a unique tone of voice that accompanies them. 4. Your B2B customers don’t want stories, they want facts. Just because you are working with other businesses, doesn’t mean you’re talking to inanimate objects. You are talking to people, and people like stories. I like stories, my friends like stories, my coworkers like stories, we all like stories. If someone were to ask me if I would like a complex scientific process (not my forte) explained purely through facts or explained in a story, I would choose story every single time. Analogies are proven to relay messages more efficiently than pure factual text. Yes, there will be the analytic types that want a spreadsheet of numbers, and we’re not saying that you should avoid facts, but you can embellish. It makes the blogging part and the reading part more fun. 5. Branding is not as important for B2B as it is for B2C. What?! Who claims these things?! Branding is essential for any business. To reiterate, just because you are talking to other businesses, doesn’t mean you’re off the branding hook; branding builds trust with customers. If we are focusing on trust, your B2B customers actually have more weight in their decisions than B2C customers. If a business professional makes a terrible investment, his/her reputation and his business are in jeopardy. So, let me ask you this question: “Do you still think branding isn’t important for B2B’s? 6. The only way to develop leads in B2B is through word-of-mouth. Maybe that’s how it used to be. We used to have to rely on print advertisements and word of mouth, but now there are countless tools to help market your small business. Though social media is a relatively new tool, and blogging has recently become more accessible to everyone, they are growing immensely in popularity… not just for millennials. Go through your Facebook friends really quick, is your mom on Facebook? Maybe your 30-year-old child? I guarantee they are! Because social media isn’t just a youth fad anymore, it has actually changed the business, news, and media world. Crazy huh? Your business-minded customers are also on social media. If you don’t believe me, look at this infographic.